Nothing makes me happier than a good hamburger or cheeseburger, preferably charcoal grilled or from a super hot frypan. The cuts commonly used to make ground beef are the the working muscles, such as the front and rear shoulder muscles. These muscles have more fat, collagen and connective tissue and are more flavorful than leaner cuts that come from the loin and rib. Chuck (16-22% fat) and round (10-15%) were the cuts of choice until saturated fat became the scapegoat for almost every malady know to mankind. Sirloin (5-10%fat) was then added as a lower fat option. Sirloin is not a universal choice for all ground beef recipes, however, because of the low fat content it can be very dry and overly firm when cooked to well done. It’s an excellent choice for steak tartar or a very rare burger. I love a good hamburger, sometimes a cheeseburger. I’m a bit pedestrian when it comes my burger compared to all the varieties that abound these days. I love bacon, but NOT on my burger! I love blue cheese, Brie and all sorts of gourmet cheeses, but NOT on my burger. I love sautéed onions, chili, fruit, salsa and all the other concoctions people are piling onto burgers these days, just NOT on my burger! I’ve been to Bobby’s (Flay) Burger Palace, Five Guys and Danny Meyer’s Shake Shack and I skip the house specialties with the special sauces. A good bun, cut in half and lightly toasted is an other essential. Cover the bottom of the bun with French’s mustard, a generous helping of chopped onion (red or white), crispy lettuce leaves (iceberg or Romaine), plump, juicy tomato slices seasoned with salt and pepper, a perfectly cooked burger (medium-rare to medium with crispy edges), pickle chips and close it up with the top bun. 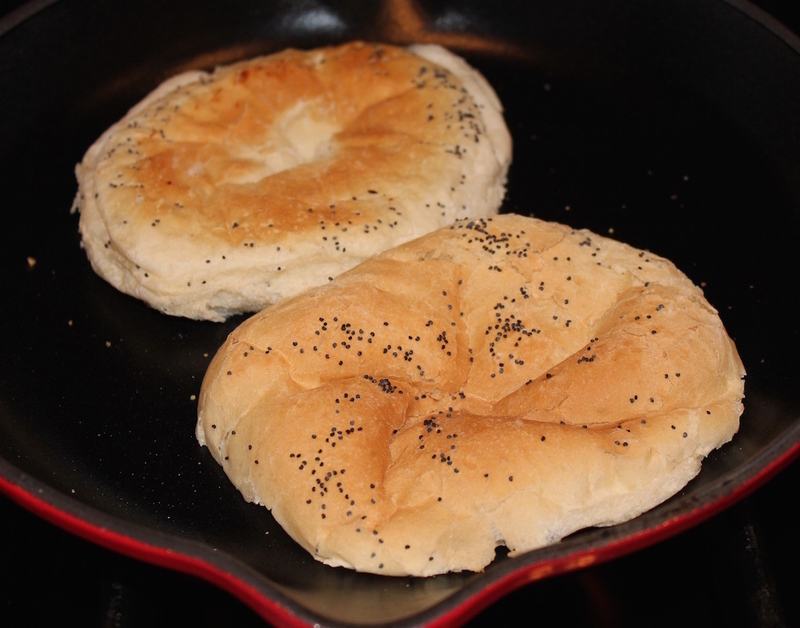 Start with a good bun, cut in half and lightly toasted. 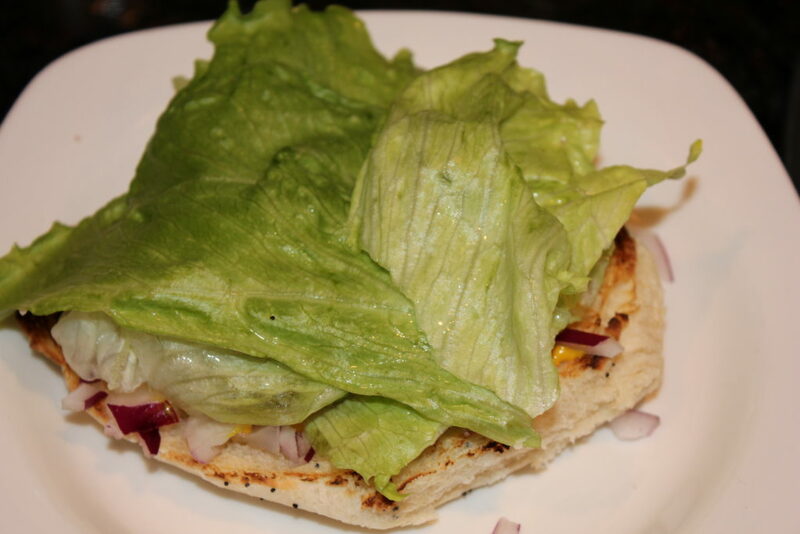 Cover the bottom of the bun with French’s mustard or any condiment of your choice. 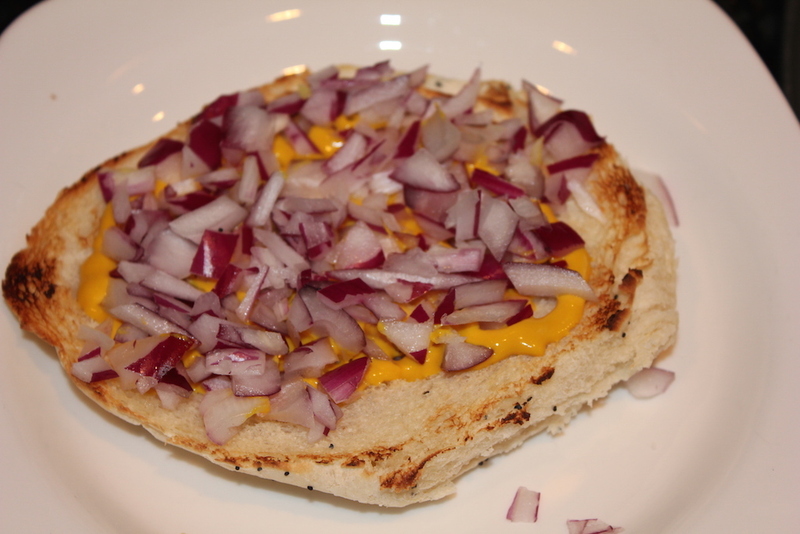 Add a generous helping of chopped onion (red or white), or caramelized onions or …. Add some crispy green lettuce leaves. 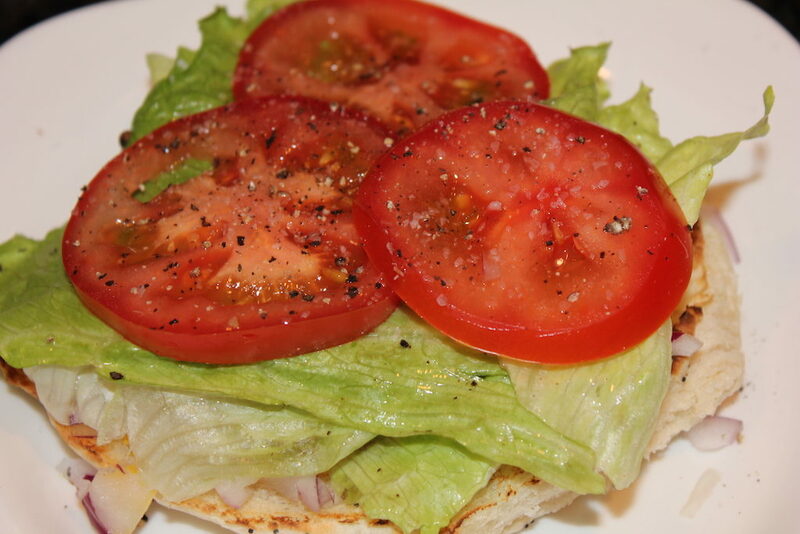 Top with tomato slices seasoned with salt and pepper. Heat a pan over very high heat. Pour in a dollop of peanut oil and spread it around the bottom. 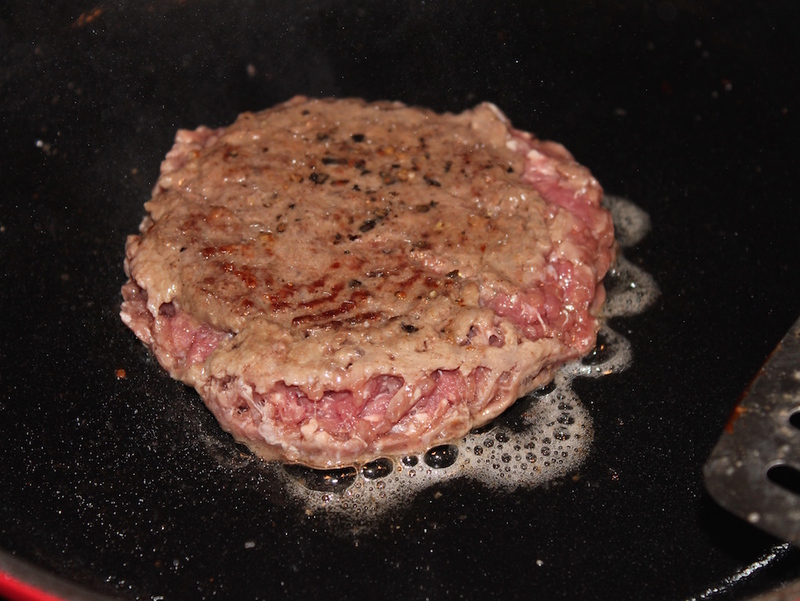 Season both sides of the burger with kosher salt and ground pepper and place the it in the pan. Listen for that sizzle! Cook for three minutes. Flip and press down to flatten a little. The juices contain fat, which will crisp the outer edges. Cook for two minutes. 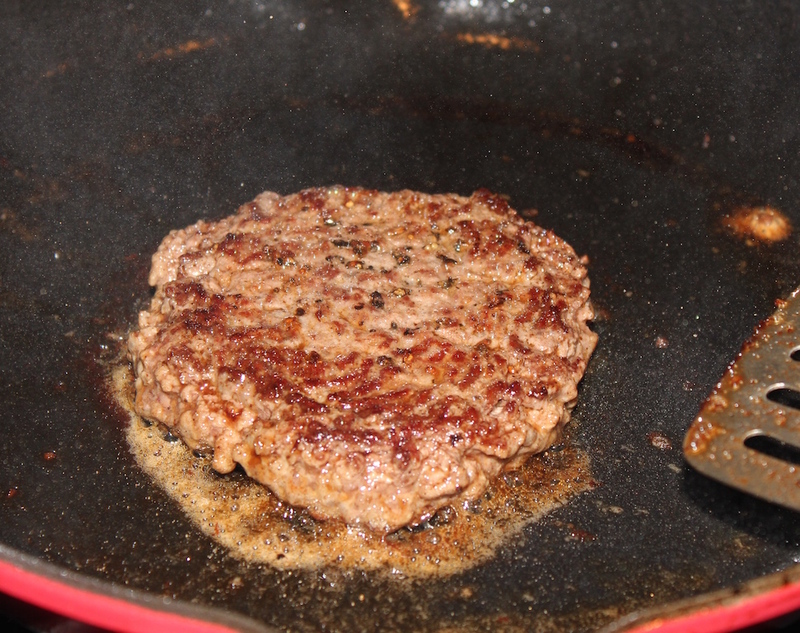 Flip again for one minute and again for one minute more – now it’s time to add cheese if you’re making a cheeseburger. A perfectly cooked burger, medium-rare to medium with crispy edges is my preference. Cook for a minute or two less for rare or a minute or two more for well done. Place on top of the dressed bun and add a few pickle chips. Close it up with the top bun and consume! 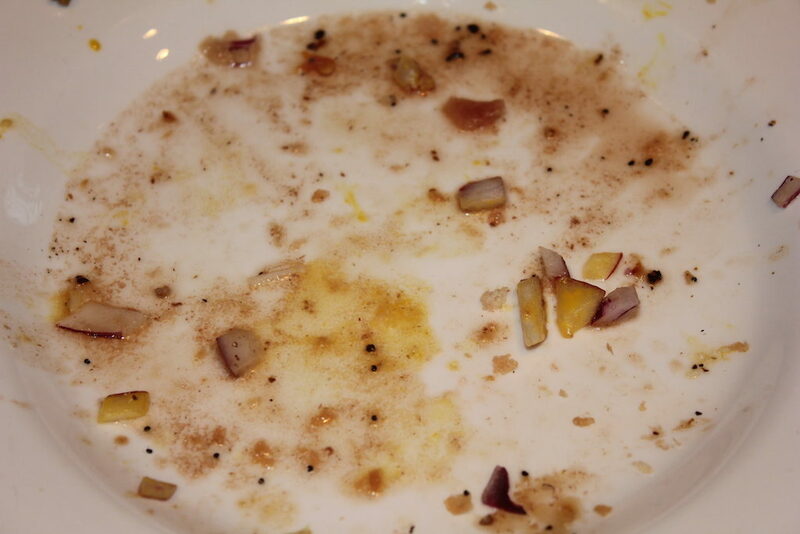 These remains are the sign of a perfect burger, one where the juices run down your hand and every bite has all the fixings! There’s nothing quite as satisfying as a good hamburger or cheeseburger. This recipe is written for one. Multiply for as many as needed. Start with a good bun, cut it in half and lightly toast. Cover the bottom of the bun with a sauce of your choice. Add a generous helping of chopped onion (red or white), caramelized onion, or sautéed onions and peppers. Top that with something crisp and leafy, such lettuce leaves, kale or cabbage. Adorn that with plump, juicy tomato slices seasoned with salt and pepper. Set a perfectly cooked burger, which has crispy outer edges and a juicy center, on the dressed bun. Top it off with pickle chips or pickled jalapeños. 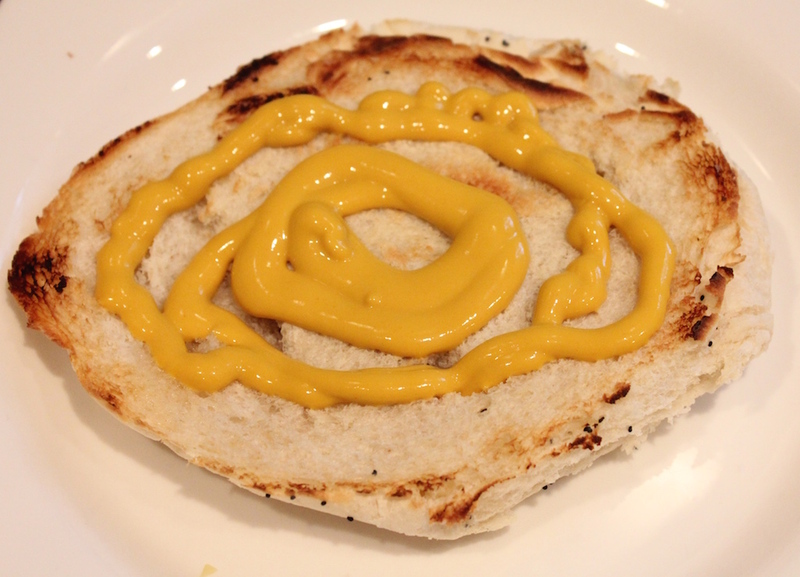 Cover the bottom of the bun with a condiment of your choice. Add a generous helping of chopped onion (red or white), or caramelized onions or sautéed onions and peppers. Add some crispy and crunchy leafy greens. 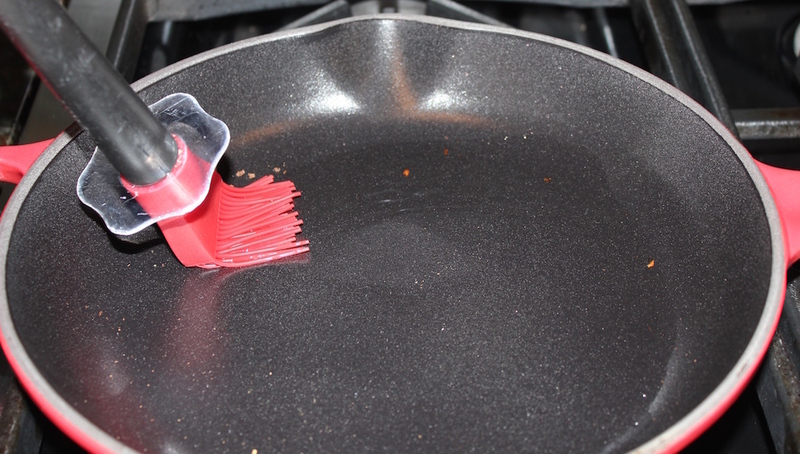 Place a pan over very high heat. Pour a dollop of peanut oil and spread it around the bottom. 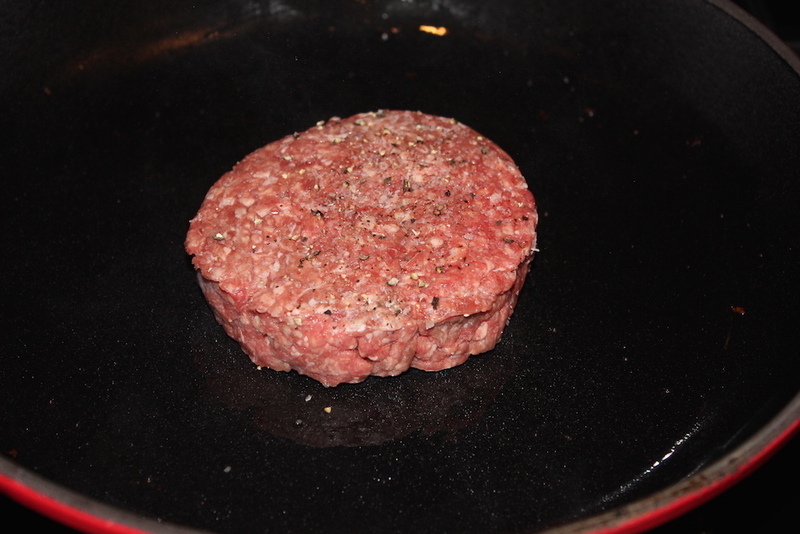 Season both sides of the burger with Kosher salt and freshly ground pepper and place the it in the pan. Listen for that sizzle! Cook for three minutes. Flip and press down to flatten a little. The juices contain fat, which crisp the outer edges. Cook for two minutes. Flip again for one minute and again for one minute more – now is the time to add cheese if you’re making a cheeseburger. 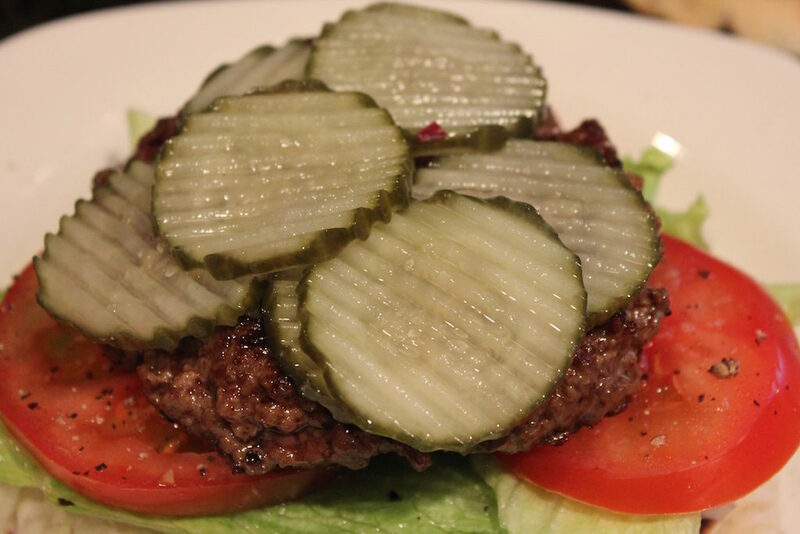 A perfectly cooked burger is juicy with a beautifully seared exterior with slightly crisped edges. Cook for a minute or two less for rare or a minute or two more for well done. Place on top of the tomatoes. Add a few pickled chips or pickled jalapeños. Close it up with the top bun and consume!